A frenzied, elegant action game that pulses with great music and demanding thrills, for only 2/$3. Monday's review: You're a small triangle navigating a maze as its walls pivot and spin toward you in predictable patterns and with increasing speed. Avoid the walls for as long as you can and compete for the longest times. It's fun, but too small, simple and hard to provide lasting pleasure. 60%. Tuesday's review: I came back to it just for the music. It's 8-bit, but less concerned with high-pitched bleeps than dirty, throbbing beats. The music doesn't become repetitive either, despite dying and restarting dozens of times each minute, as it begins at a different place in the song after each death. There's a moment at one minute forty seconds into the track Courtesy that's all I need to beat my best time. 72%. Wednesday's review: There's a surprising amount of nuance in the design. The lovely way your ship slightly sways in the direction you're turning, or how your sides can safely graze surfaces so you're always surfing the edge of failure. Even the female voice that announces the game's name is canny, making it feel like you're plugging yourself into an entrancing futuristic machine. 78%. 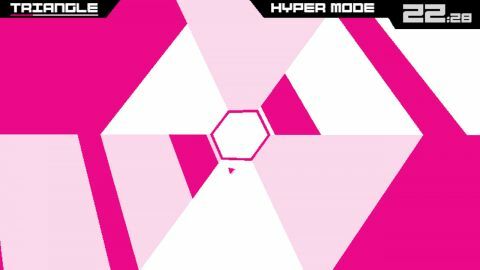 Friday's review: Super Hexagon is about reaching escape velocity from your own feeble reflexes. It's about defeating a never-ending, corporeal chiptune. It's a game you dance to, as much about surfing music as AudioSurf. It's a puzzle game, about memorising routines and overcoming mental blocks. It's the ludological purist's answer to Hotline Miami. It's about momentum, speed, grace under pressure. When I play it, I don't blink. When I die, I'm never frustrated. In moments when it has me in rapt attention on its dancefloor, it's the greatest game in the world. 96%. Saturday's review: The sobering light of the morning always brings perspective. Super Hexagon is fun, focused, elegant and compulsively challenging. For some, it'll be an intense months-long relationship. For most, it'll be more like a single life in the game itself: thrilling, a worthwhile learning experience, and over quickly.